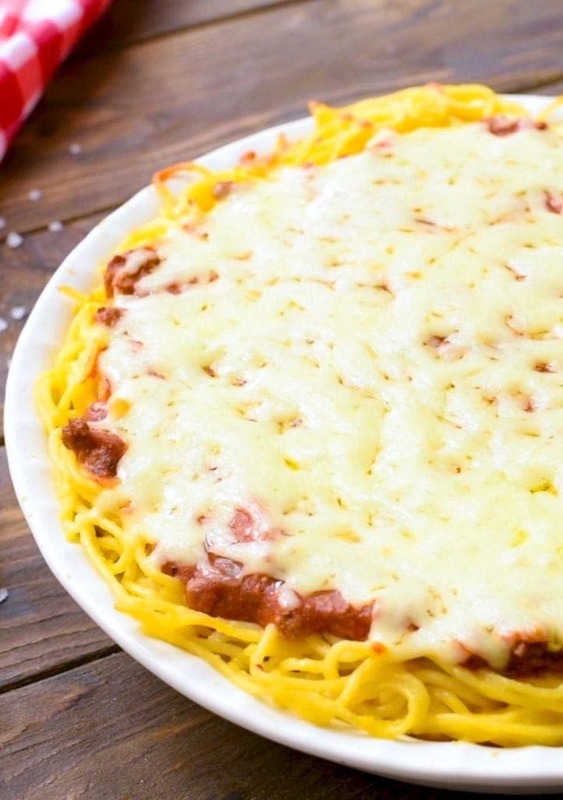 This delicious baked Spaghetti Pie recipe is going to be a new family favorite for dinner! 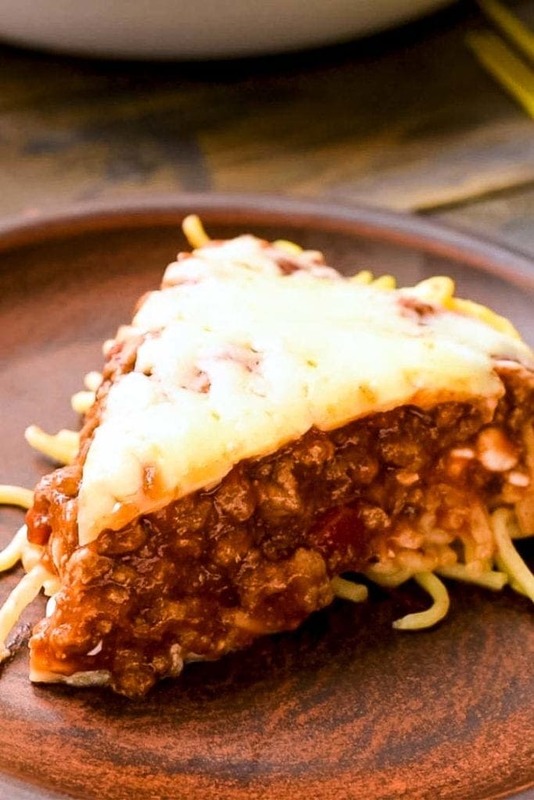 The crust is made of spaghetti noodles then piled with cottage cheese, a meat sauce and shredded cheese! It’s one our families favorite dinner meals. 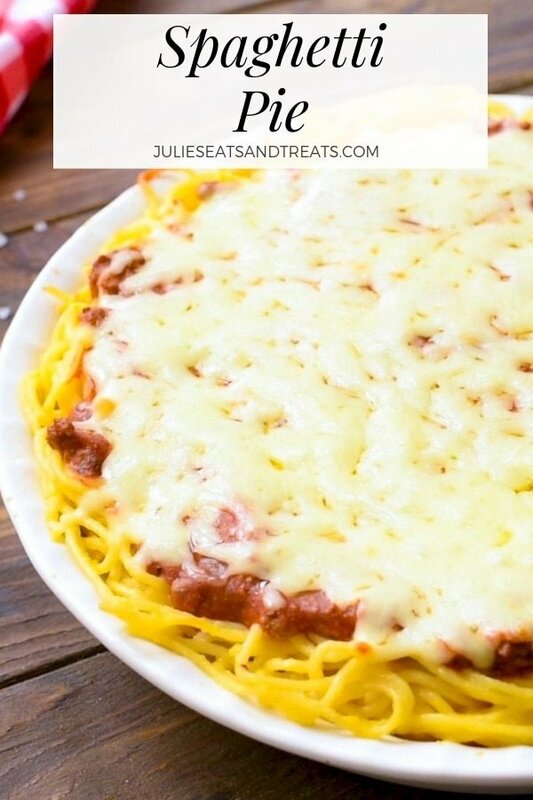 Spaghetti Pie Casserole is a great take and bake recipe to take to loved ones or for a busy weeknight meal. It’s also a great freezer-friendly meal! 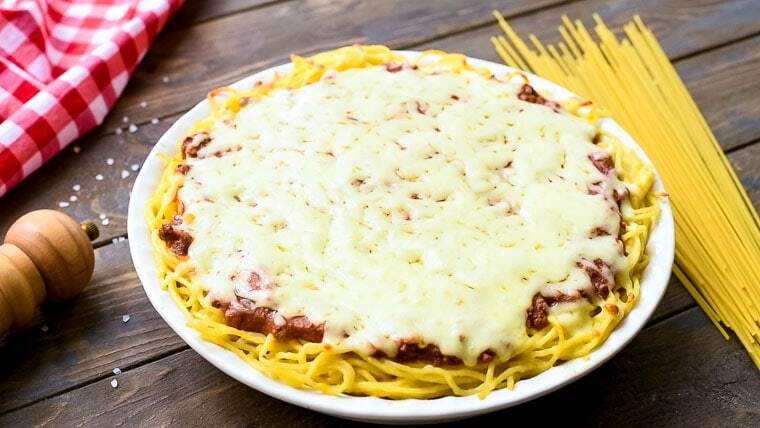 A bed of spaghetti noodles, piled with cottage cheese and delicious meat sauce and Mozzarella cheese! How’s the sound to you? Amazing? Perfect? Then you are going to love this Spaghetti pie because that’s what I just described. Pair it with these Easy Homemade Bread sticks and this Greek Salad and you have a meal! I love Saturdays. Well, Saturdays off that is. There is nothing like a day with nothing on your agenda. First I went and did a little Valentine’s day shopping. I have never spent so much time in a card aisle. There were tons of cards and I was struggling to find the “special, perfect” card. With the shopping done I headed out to mom and dad’s house. Mom and promised me coffee and monkey bread. I mean seriously who could pass that up? My little brother came over and then my husband and his little brother stopped by as they were out in the neighborhood and couldn’t pass up the monkey bread. After that, well I have done nothing. Blissful! Now we are planning supper, out to Jason’s dad’s house for a bit tonight, and then to a wedding dance and picking up our niece from that. I’d say that’s a good Saturday! On to the recipe I’m sharing today. Spaghetti Pie is a staple from the Koehl household, you can tell I steal lots of recipes from my mom. It’s a bit of a different twist on the plain old spaghetti and kids and adults seem to love it, so here it is! My family loves it as much as I did when I was growing up so it’s a tradition I’m going to keep going with at meal time! What can you do with leftover spaghetti noodles? pasta casserole – there’s a ton of recipes here that are amazing! Can spaghetti pie be made ahead of time? Absolutely! Prepare the recipe but hold off on baking it until dinnertime. To reheat leftovers, cover with foil and bake in a 350-degree oven for about 20 minutes or until heated thru. 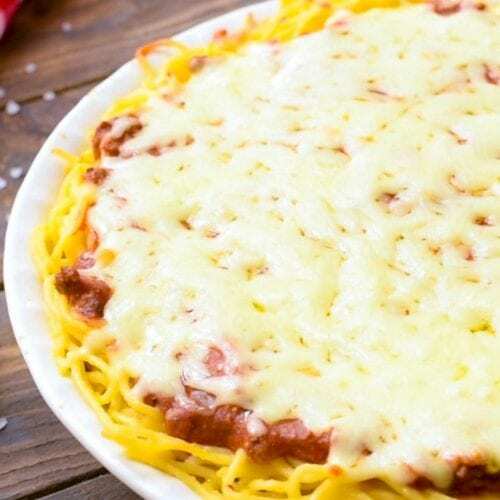 Can spaghetti pie be frozen? Yes, it spaghetti pie casserole can be frozen and reheated. Why not make a double batch? Cook once, eat twice – everyone loves this recipe! What’s my favorite part of this meal? Leftovers! I love grabbing a slice and heating it up in the microwave – delicious! That also means I don’t have to make dinner again. How do you make a spaghetti pie casserole? Cook spaghetti until al dente – do not overcook! Drain, combine with eggs cheese and butter. Pat the mixture into a pie plate to form a crust. Add cottage cheese to the top of the crust. Brown hamburger, drain and add to spaghetti sauce. Bake for 20-30 minutes. Top with mozzarella and bake an additional 10 minutes. More delicious pasta casseroles you should be sure and try! Don’t forget, take a moment to leave a comment with a five-star rating! I’d sure appreciate it and I know you’ll love this easy casserole! On Instagram? Awesome – you can tag me with @julieseatsandtreats or #julieseatsandtreats! An easy dinner recipe that is soon to be a favorite! 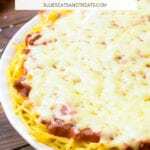 This Spaghetti Pie has a bed of spaghetti crust, then is piled with cheeses and a meat sauce. Cook spaghetti until almost tender. Drain. Combine with eggs, Parmesan cheese and butter. Pat the mixture into a 10 in pie plate to form a crust.Top crust with cottage cheese. Brown hamburger, drain and add to spaghetti sauce. Put on top of cottage cheese. Bake at 350 degrees for 20-30 minutes. Top with mozzarella cheese and bake 5-10 more minutes. Let stand 5 minutes before cutting. Made this for dinner tonight and it was a big hit!! Glad you enjoyed it Karen! The way I learned it in Indiana was to add chopped scallions to the cottage cheese & use cheddar vs mozz. Big family fave! Kids really love it. Your recipe motivated me to make a batch since I had all of the ingredients, so thank you! My 30 yr old son thanks you too since he loves spaghetti pie big time! Even took a huge batch to work the next day for lunch. Would this work without cottage cheese? You could sub ricotta or skip it I think. Do you bake and let it cool before freezing or just assemble and freeze? Made this for dinner tonight, and we loved it! 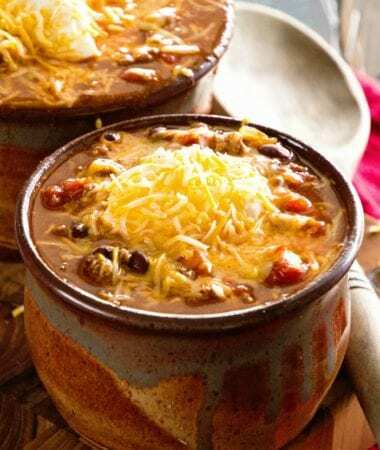 Cheesy and delicious, and perfect comfort food! And my husband will be taking leftovers for work tomorrow. 🙂 Thank you so much for sharing! This looks like such a fun idea to give spaghetti & sauce a facelift. Great way to mix up a favorite!